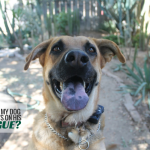 You are here: Home / Why Do Dogs / Why Do Dogs Go Crazy After a Bath? Does your dog go crazy after a bath? If so you’re certainly not alone. You know what I’m taking about; we’ve all witnessed that canine post bath craziness first hand. It’s that excitement our dogs get when they’re finally free of the bath. They seem to undergo some sort of temporary insanity as soon as they’re let loose. 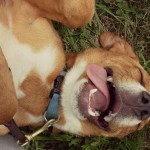 It’s usually pretty endearing; it always puts a smile on my face to see my dog experience such boundless joy. There she goes. Running around the house; rubbing against everything she can find. Did I mention running around the house like a complete maniac? Some call it the zoomies, some call it the rips, and some professionals that are much smarter than I am call it by the scientific term FRAPS (frantic random activity periods). Most dogs dislike the bath, and one of the main reasons why dogs go crazy afterwards is because they’re relieved that it’s all over. After a bath our dogs go nuts because it’s a quick way for them to release pent up energy. Even if your have a water loving Lab chances are he’s not too fond of bath time. There’s something about bath time that makes most dogs pout. My dog Laika loves lakes, rivers, creeks, mud, and the sprinkler — she loves the water except when it comes to getting a bath. I make it as easy and calming as possible for her and yet she still gives me the sad puppy dog eyes. Many dogs feel restrained and stressed when being bathed. They may tolerate it but it’s not something they’re eager to do. When they’re finally able to jump out of that tub it’s as if they’re experiencing pure freedom. No longer held back by you (their evil shampoo wielding owner) they are free, and with that feeling comes excitement. Imagine you’ve just done something you were terrified of – whether that’s sky diving or riding in that scary elevator at work that’s always breaking down – when you’re done you often feel a sense of adrenaline. It’s a rush of excitement — if you were able to conquer that then you can do anything. Many people speculate dogs experience a similar level or excitement and exhilaration once they’re freed from the tub. It might be the pent up nervous energy or it might just be a sense of freedom. Whatever it is the end result is usually the same; no holds barred zoomies. You may love the smell of your dog’s shampoo but chances are Fido might not be so keen on it. Dogs sense of smell is way better than ours -at least 10,000 times more acute than a humans. 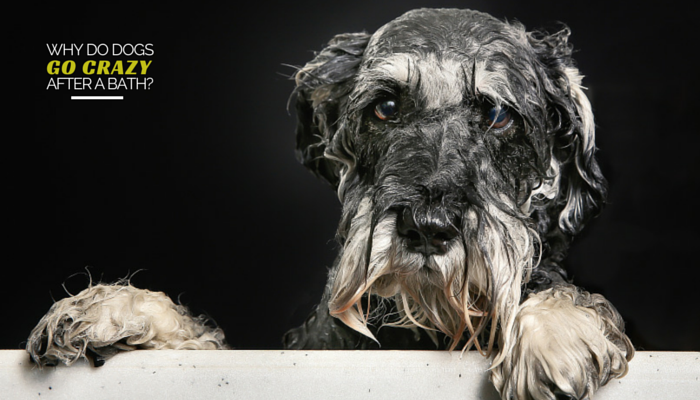 After your dog is bathed they’re covered in a whole new scent — one they might not be happy with. Dogs love rolling in all sorts of gross stuff, and dogs certainly don’t mind smelling like dogs. Rolling around and rubbing against everything in the house is a quick way for dogs to get some of their distinctive scent back after a bath. After all it took them a while to come up with such a unique scent, and you just undid all their hard work. I mean I know love the smell of Oatmeal shampoo more than dirt, but my dog strongly disagrees. Although dogs might be trying to dry after off I’ve never seen my dog get the zoomies after swimming outdoors. Many dogs tolerate baths although they probably don’t love them. They do a pretty good job of trusting us and sitting still through the whole ordeal, though bath time stresses out many dogs. If you’re placed in a stressful situation your mind doesn’t stop – you’re just waiting for it to be over. Your body might be wanting to flee and yet you’re having to tell your brain to stay; this can lead to a lot of pent up energy. Well our dogs do the same thing, and that helps explain why they go nuts after a bath. 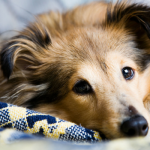 Dogs have nervous energy that gets pent up as well, and bath time is a common trigger. And once that stressful bath is over you’ll see it being released. Once they’re finally free from the tub they often exhibit the “zoomies” or “FRAPS” (frenetic random activity periods). My dog starts zooming around as soon as she gets out of the bath, and it’s quite fun to see her getting all that energy out by running circles around the house. Dogs love a good massage or petting – but most don’t enjoy bath time, even if they love the water. They love your attention but hate the tub – so what do they do? My dog Laika not only gets a crazy case of zoomies after each bath, she also gets all giddy & excited. She’ll give me the play bow and bring me her favorite toy. All that excessive playful & hyper behavior does make me wonder if post bath time is perfect for releasing all that pent up energy. Another reason dogs go crazy after a bath is because the may be trying to get rid of water in their ears. If your dog buries his head into towels or onto the carpet after bath she may be trying to get rid of some of that water. After coming in from the rain my dog Laika will often rub her head up against furniture or anything dry she can find. Because her ears are upright they have a tendency to get a lot of water in there. When it’s obviously bothering her I’ll take a dry towel and gently pat the inside of her ears. Laika goes nuts after every bath, no matter how short and sweet we make it those post bath zoomies remain constant. There’s something so enjoyable seeing her whip around the house like a madman afterwards. Witnessing that amount of pure joy and excitement puts a smile on my face every time. How about your dog? 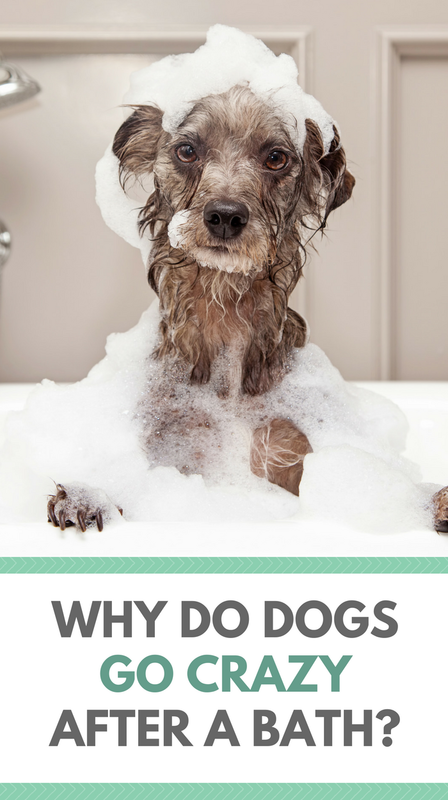 Does your dog go crazy after a bath? Does your dog go nuts after they get wet? Does your dog get the zoomies and run around the house like a maniac after bath time? All our guys always went nuts after a bath. But Jasmine also went nuts after a swim in a lake or on a cool day. Might be a response to the cooling effect on the body. Well now that just adds to the mystery – I did read a few theories on the cooling effect. They all have crazy zoomies after a bath! I don’t know of any dogs who don’t, either. Haha! I thought the video was so cute! I have a pretty calm, laid-back dog and even he runs around like crazy after a bath. He’s so happy to be free! He also loves to roll around after a bath and rub himself on everything, so I like your suggestion that dogs might do this to try to get their own scent back. Then again, Ace rolls around in other situations where he’s really happy, too. He gets excited when my husband comes home from work and often starts rolling around then! Cute. Ha!!!! I thought it was just mine!!! BOL!!! These are actually pretty good theory’s! I never really thought about why, I just think it’s hilarious that they do it! I’ve always wondered about that too. Every dog I’ve known does that. I’ve heard several people talk about their dogs immediately going outside to roll in something gross right after a bath, so I’m voting for the ‘getting their scent back’ theory. It really is hilarious to watch them run around, lol! Interestingly, I’ve had a couple dogs who haven’t done the zoomies. One is Maggie and I think her fearfulness keeps whatever excitement she may feel in check. The other was Tino. Tino was an old soul and rarely showed excitement – he was the most even-keeled dog ever…so zoomies were not part of his repertoire. OH my gosh! My fiance and I were just talking about this last Sunday after bathing our boys! Great information here and throughout your site! Well, whilst I understand dogs not liking the smell of their flee shampoo (tea tree oil smells bad enough to a human, but x10,000 it must be eye watering). However, I actually choose to see the universal K9 response to bath time as a positive response. My dogs see the towels and head straight to the bathtub in response. Why would they do that if it was an entirely horrific experience? Whilst they may not actually enjoy it, they accept it as part of the routine and are clearly okay with it. I reckon dogs feel good after a bath. Whilst they may not like the shampoo smell, the feeling of being showered in warm water, massaged and having your fur feel soft and wispy in the breeze may just be doggy heaven…who knows? Also, when you’re covered in fur, how often do you really feel cool? How often do you really feel the breeze on your skin? I’m willing to bet you are right. We own a self-serve dog wash in Lincoln, NE and we see this sometimes as soon as a dog is let out of the tub, but not all dogs do it and part of the reason for this might be that we use warm water in our sprayers and the place is so clean that there’s no enjoyable dog scented smells around to rub against in hopes of getting their clean off. Confinement might have something to do with their typical lack of the zoomies too since there’s not a lot of room to run around. Also, it seems to us that small dogs do this more than the larger dogs, or at least with more vigor. We see our own big dogs experience the zoomies mostly in the winter when we let them out into the back yard during or after a big snowfall. They will look out the window and watch the snow fall with great anticipation, and then when let out they burst into the yard like they’ve never seen such wonderful stuff and felt so good in all their lives. The next 10 to 15 minutes are usually spent sprinting through it, diving into drifts face first, and bouncing and rolling around like children at play in a pile of fall leaves. They are a blast to watch and we are so glad we have such wonderful companions in our lives. Glad I’m not alone! My little guy loses his freaking mind after a bath. He’s currently running around the apartment barking and going nuts. He’s acting liked he won the lottery. It’s adorable, but weird. The constant shaking is just too cute. I wouldn’t dare use a hairdryer on him, so he just has to air dry. He’s currently drowning me face and nibbling my earlobe. Help! Ahhh my Lil Bit tolerates a bath. ..he doesn’t hate it, but I can tell he doesn’t love it. ..as soon as I get him out of the tub he is shaking insanely and rubbing and flipping all over my bed (where he sleeps)…I can’t help but to giggle every time he gets out of the tub…I love the oatmeal shampoo as well. ..and it’s good for his skin. .I sure do love my baby! I always thought that he just loved being clean. Mine will go crazy for about an hour afterwards. He gets really excited when I tell him it is bath time so I do not think it is any kind of anxiety. I always have treat for him after his bath so maybe that is why. Hahaha. My dog go nuts after bath because of the water she feel good after bath and she is very happy. But I dont like these theories about dog? Better to study before make a big story about dog. Go to main point. Why dog go nuts after bath? Simply answer: They feel good and the water gave them different feeling. Is like when you trying to give them food they are happy. how about this item ?